Letters existed in-print only and, only in the hotel rooms. 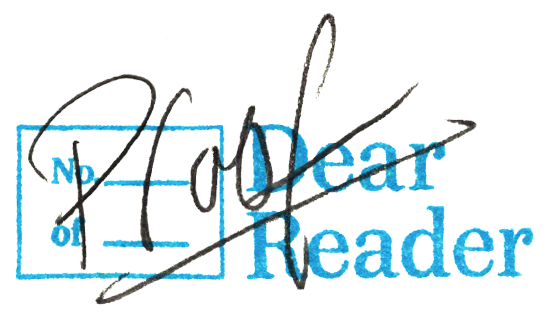 There was also an annual Dear Reader, Live event where authors (or special guests) read their letters and other works in person. These were always packed houses and I believe Ace has audio recordings of most - maybe we’ll hear someday. Since I’ve left Ace I can’t vouch for how accurate or up to date this link is, but there were a bunch of short 5-questions style interviews with program authors up on the blog in partnership with Tin House. I am pretty sure this list is accurate: Atticus Lish, Saeed Jones, Chelsea Hodson, Dale Peck, Sigrid Nunez, Lucas Mann, Kiese Laymon, Catherine Chung, Chinelo Okparanta, DarkMatter, Daniel José Older, Elif Batuman, , Morgan Parker, Alexander Chee, Kaitlyn Greenidge, Tommy Pico, Wo Chan, Natalie Diaz, Alice Sola Kim, Ioannis Pappos, Jami Attenberg, Tyehimba Jess, Tracy O'Neill, Porochista Khakpour, , Garnette Cadogan, Jenny Zhang, Claire Fuller, Jia Tolentino, Christopher Soto, Claire Vaye Watkins, Alexandra Kleeman, Leslie Jamison, MIA ALVAR, CARMEN MACHADO, Danez Smith, Kaveh Akbar, Morgan Jerkins, Joshua Jelly-Shapiro, Rowan Hisayo Buchanan, Naomi Jackson, Rosalie Knecht, Michelle Tea, Ocean Vuong, Tayari Jones, Jamel Brinkley, Fatimah Asghar, Michael Arceneaux, Hieu Minh Nguyen.